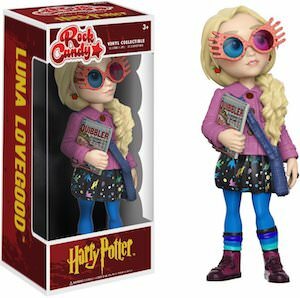 If you are a true Harry Potter collector then this Luna Lovegood figurine is what your collection needs. 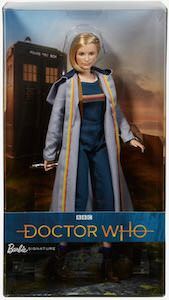 This a Rock Candy Luna Lovegood figure that is 5 inches tall and is a highly detailed figurine of the cool Harry Potter character. Luna is wearing her famous glasses and is holding a copy of the Quibbler under one arm and she did bring a bag for other things. And The Luna figure comes in a cool box in which you could keep her if you want to keep her in new condition but other wise she would look great in between other Harry Potter gear. And Luna Lovegood is rated for ages 3+ so even the kids can play with her as a cool toy. 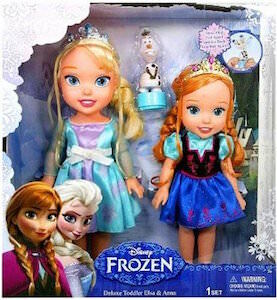 If you ever wondered how Anna and Elsa where as kids then this doll set will be perfect for you. In this set you find two dolls one of Elsa and one of Anna and they are not like their grownup side like we seen in the movie. These dolls are like the sisters where when they where toddlers. And besides the two princess dolls there is also a fun toy Olaf to play with. Kids 3 and up can enjoy playing with Elsa and her sister and I am sure they gone love to have a set of these. The Frozen sisters toddler dolls are the same size as the other toddler dolls from Disney so you can ad them to you collection to. Little girls everywhere will remember the hit Disney movie Frozen with this amazing color changing Anna doll. Princess Anna of Arendelle felt that she didn’t have the magic touch like her sister, but with this doll set, Anna can be helped to magically change the color of her crown and dress bodice. 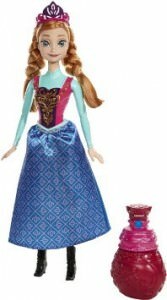 This color change Anna doll is wearing her blue dress with pink bodice and crown and comes with a plastic perfume bottle that you fill with very, very cold water that you spray on her to change the color of her crown and bodice. Spray again with warm water and the colors change back. Take a look at this Disney Frozen Color Change Anna Doll. This is an Elsa the Snow Queen doll from the hit movie Frozen, Elsa also comes with the friendly snowman Olaf. 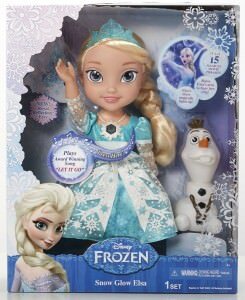 The Elsa doll is dressed in a beautiful icy snow gown that is blue and white, she is also wearing her magical snowflake pendant that lights up when she sings dofferent songs “Let It Go” and says 15 total sounds and phrases from the movie Frozen. This will be an amazing gift for any Frozen fan, you get Olaf and you get the Elsa doll which is part of the Disney “My First Princess” series. Collect and play with the Disney Frozen Elsa And Olaf My First Princess Singing Doll. Anna of Arendelle is determined to save her kingdom in the wonderful Disney adventure of Frozen. Anna gets help from her Elsa and her friends, Olaf the snowman Kristoff and Sven the reindeer. Anna is dressed in her ancestral dress that is full of flower designs of blue and pink. She is wearing her pink cape and her pretty pink crown. Her hair is long with beautiful braids and is always wearing her smile. The Anna Doll stands at approximately 12″ tall and for the collectors out there, she comes in a beautiful clear box that you can keep her in to put on display. Don’t forget to build a snowman with your new Sparkle Anna Doll From Disney’s Frozen. If your favorite character from the hit Disney movie Frozen is Kristoff, then this Kristoff doll is the perfect addition to your collection. Any child would be thrilled to received and play with Princess Anna’s courageous friend Kristoff. Kristoff comes in his traditional mountain man ensemble with his bright blue shirt, warm grey pants, knee-high boots that curl up at the toe, warm cap and fur-trimmed vest tied with a burgundy sash. Whether Kristoff is in the ice fields harvesting ice with Sven or in town with Princess Anna, he will always look his best in this outfit. Be sure to take a closer look at this Disney Frozen Kristoff Doll. What is better than one awesome Marvel Comics Superhero? Yes a team of them called the Avengers, and to top it off how about an Avenger inside an Avenger inside an Avenger inside an Avenger all inside of an Avenger. This is a really cool set of nesting dolls that feature the superhero cast the Avengers, from smallest to biggest find Nick Fury, Iron Man, Captain America, Thor and last but not least The Hulk. All of these Marvel Comic nesting dolls fit into each other and finally The Hulk holds them all, the smallest Avenger is 2 inches and the largest is 4.5 inches. 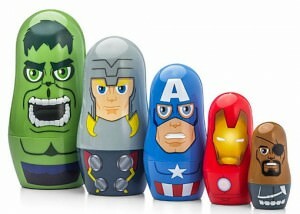 Collect and show off these Marvel Comics Avenger Nesting Dolls. Maleficent is the awesome Disney movie about the untold story of the iconic villain from the 1959 classic Sleeping Beauty. This is a doll of Maleficent that is titled “Dark Beauty”, this doll has so much intricate detail making this look just like Maleficent as she does in the movie. Find her in a long black and glitter christening gown with her unforgettable black curved horns on her head. The Maleficent doll stands 11.5 inches tall and is an officially licensed Disney product, it also comes in window box packaging making it perfect to collect and display without removing it from the box to keep the doll in mint condition. 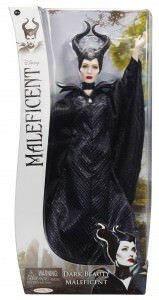 Collect or play with the Disney’s Maleficent Dark Beauty Doll. Elsa of Arendelle has captured the many hearts of Disney fans, now you can have your own Elsa doll that you can re enact icy cool adventures with. This doll features the beautiful blue gown and glittery blue tiara seen on Princess Sparkle Elsa in the awesome animated Disney movie Frozen, with so much detail you will think that she has jumped out of the television screen and right into your hands. The Princess Elsa doll measures approximately 5.5 x 2.2 x 12.8 inches and will be perfect for play or if you want to just collect and display. 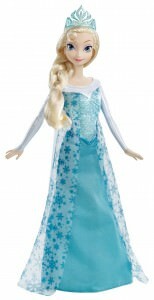 Don’t wait, go and get the Disney Frozen Sparkle Princess Elsa Doll.